JBJ95 have dropped the track list for their upcoming comeback! The duo will release their second mini album ‘Awake‘ on March 26th. Check out the track list for ‘Awake‘ below! The title of all the songs on the album suggests that they will be calm and sweet songs. The background image of the track list, a few flowers amongst a patch of grass, also suggests that the songs will be easy to listen to. The title track ‘Awake‘ shares the same name as the mini album. 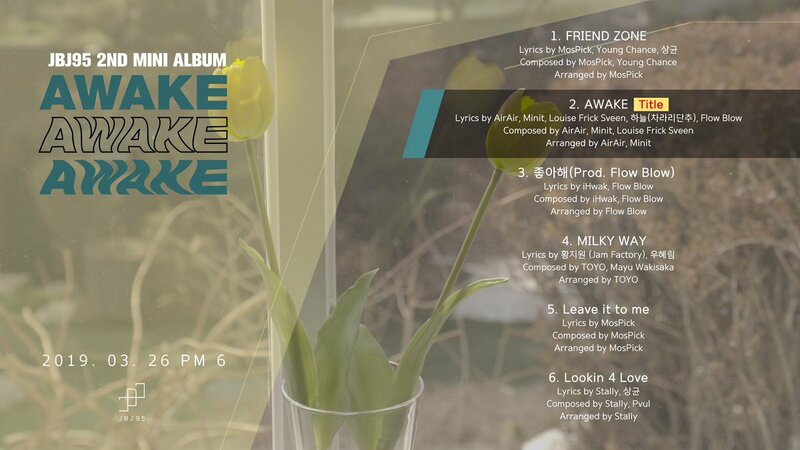 In ‘Awake‘ Sanggyun was involved in the lyric writing of ‘Friend Zone‘ and ‘Lookin 4 Love‘. Are you looking forward to JBJ95‘s comeback? Tell us in the comments below!